In software development, there are two basic types of testing: alpha and beta. In alpha testing, you don't let your product out-of-house as you work out kinks in the system. Beta testing brings the product to the public - or a small subset of the public - for feedback. I believe Kentucky Coffee Stout is in its own version of beta testing. With much hype on twitter throughout the preceding day, a keg of the first new brew from Alltech's Lexington Brewing Company was tapped at Lexington Beerworks. 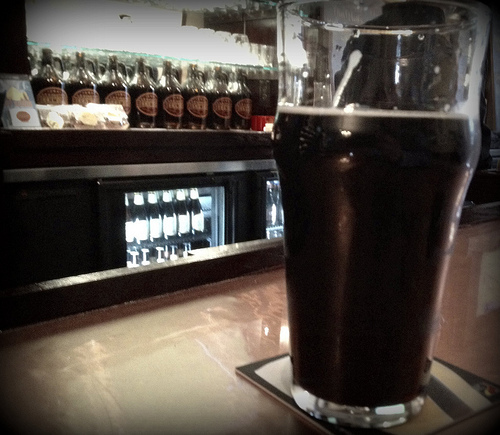 A few other locations also have the stout on tap. Alltech launched Kentucky Bourbon Barrel Ale in 2006 and this is their first new beer since. Other brews in the lineup are Kentucky Ale and Kentucky Ale Light. I'm a huge fan of all of their beers and was very excited to try Kentucky Coffee Stout so I didn't tarry on my walk to Lexington Beerworks. A few sips in, I remembered to snag a photograph. As I talked with the barkeep and a few other patrons, we all had very similar tasting notes. First and foremost, the flavor was great. Starting with a good beer like Kentucky Ale and adding in an excellent coffee bean, Alltech has produced a fantastic flavor. Flavor is the beer's strength, but its body is its weakness. The coffee beans are from parent company Alltech's Café Citadelle - a fair trade coffee from Haiti. (Haiti is one of the world's poorest countries, is located on the western half of Caribbean island Hispaniola, and had a devastating earthquake in 2010 bringing worldwide attention and assistance but has since gone forgotten.) I first tasted Café Citadelle at the 2012 National Horse Show in Lexington (sponsored by Alltech) and found the coffee to be really good. Dumping twelve pounds of the stuff into a batch of beer? Brilliant. 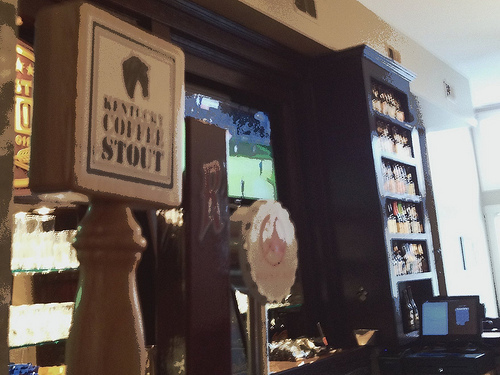 The problem with Kentucky Coffee Stout, however, was its body. A sip of a stout beer (think: Guiness, an Irish stout) should leave a slight weight on your tongue. The head on a well-poured stout should occupy about the top inch of the glass, but by the time the Kentucky Coffee Stout hit the bar its head was gone. A slight twirl of the glass left no foam stuck to the side of the glass, again something that should occur in a stout. I can attest that it was not the fault of the barkeep; I've already had a few perfectly poured stouts at the Beerworks. This fault, unfortunately, lies with the beer itself. I believe I dubbed it a stout with erectile dysfunction. It is therefore a question of Shakespearean proportion: would a beer by any other name taste so good? Ignoring the label 'stout' for a minute, you've got a damn good tasting beer. Dark and flavorful, maybe the texture is purposeful? We'll find out when this beer leaves beta testing. And it will. Because it is good.